Stack on size and strength in fast time with Amino Nutrition Mega Muscle, specially formulated for the athlete who struggles to put on and maintain weight. This protein and nutrient dense weight gain supplement offers a balanced muscle food formula. A premium blend of Hydrolysed Whey Protein Isolate and Instantised Whey Protein Concentrate in a generous dose facilitates a more sustained protein delivery for improved nitrogen balance and an environment for constant gains in mass and performance. 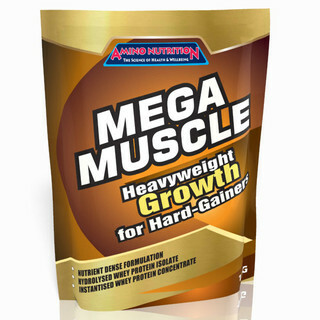 Mega Muscle is also loaded with all the essential vitamins and minerals necessary to support rapid gains in bodyweight. Simply blend 100g (3 heaped scoops) with 500mL of low fat milk, chilled water or soy milk. If you want to put on weight, 2-4 servings shold be taken throughout the day. This product can be added to any plain yoghurt, cereals, mousses, cakes, muffins, pancakes, strews or soups by sprinkling on and stirring through at appropriate times. The food is not a sole source of nutrition and should be consumed along with a nutritious diet and used in conjunction with an appropriate physical training or exercise program. Not suitable for children under 15 years or pregnant women. Should only be used under medical or dietetic supervision. Store in a cool dry place below 30 degrees celcius.